Hello everyone, today is day three of my Reader's Response week. 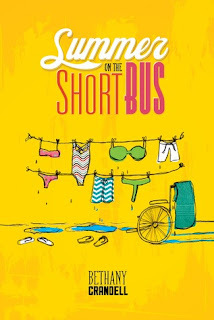 Today's genre is Contemporary, and the book that I have chosen to take a better look at is Summer on the Short Bus by Bethany Crandall. Description Spoiled, Versace-clad Cricket Montgomery has seventeen years of pampering under her belt. So when her father decides to ship her off to a summer camp for disabled teens to help her learn some accountability, Cricket resigns herself to three weeks of handicapped hell. Her sentence takes a bearable turn as she discovers the humor and likeability of the campers and grows close to fellow counsellors. Sabrina: Hello Bethany, thank you so much for joining me today and answering some questions. Bethany: Hey Sabrina! It’s great to be here. Thanks for inviting me over. Sabrina: Starting the novel off Cricket Montgomery was a questionable selfish character, however throughout the novel readers begin to see her character develop. What event do you believe really started to shift her character’s perspective? Bethany: Oh man…Cricket is the epitome of a self-centered brat at the beginning of the book, but something definitely awakens in her during the scene when all the girls are primping before they head to the pool for swim time. Even though she still sees the campers through her distorted, judgmental lenses, she recognizes—if only for a split second—that they’re all doing exactly the same thing: being teenage girls. (This is actually the scene that inspired the cover) It’s subtle, but still packs a punch and begins to reshape Cricket’s perspective. Sabrina: Throughout Summer on the Short Bus there are a lot of mentionable fantastic campers, Crickets gets the opportunity to meet. Who was the most fun to write? As well who impacted the Cricket the most? Bethany: Claire, for both of these questions. Writing a filter-less character like Claire is always fun because they say exactly what’s on their mind without apology or need for explanation. And even though their approaches, and intentions, were very different, Claire and Cricket are actually very similar which is why I think Claire had the most impact on Cricket. She saw a lot of herself in a girl she never would have dreamed she’d have anything in common with. 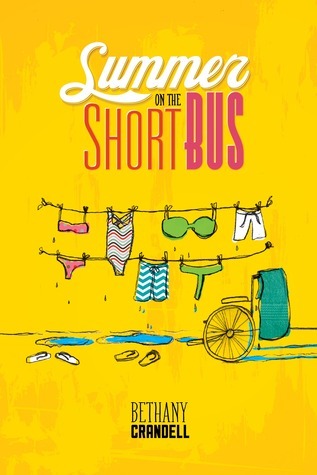 Sabrina: The plot of Summer on the Short Bus was well organized and developed throughout the entirety of the novel. Did you find any aspect of the novel hard to write? Bethany: SHORT BUS was only the second book I’d ever written (I’m working on my 8th now) so nailing the plot twists (as subtle as they were) was challenging for me. I’ve since graduated to bigger, more intricate, plotlines but at the time I remember feeling a little overwhelmed by it. *laughs to herself* It’s amazing how much you learn with every book you write. Practice, practice, practice! Sabrina: A couple of times in the novel the mention of Quinn looking like Troy Bolton is apparent. Where did the idea of having a character look like him come from? Bethany: I honestly don’t know why I chose Troy (a.k.a. Zac Efron). I think at that time my oldest daughter was really into High School Musical so he was sort of on my brain. (Based on that strategy, the next love interest I write will be the spitting image of Joey Tribbiani (a.k.a. Matt LeBlanc) as my daughter is now binging on Friends) As a reader, I always enjoy creating my own mental image of the swoony love, but because the supporting characters all had such unique, physical descriptions, I thought giving a visual image to the reader might be kind of fun. Sabrina: Thank you so much for coming today and answering some questions about Summer on the Short Bus. Bethany: My pleasure! It’s always great to hang out with you. And congratulations on your upcoming graduation! First off, my favourite thing was the beginning it had all the right details to make me want to read more. It started off with showing us a little glimpse of what the main character Constance Elaine Montgomery A.K.A Cricket was like. It also gave a view on the setting, which was much appreciated on my account. Second thing I absolutely loved about this book were the characters, and their personalities. Each character brought to the story a different element. Cricket the main character was quite selfish at the beginning, however she showed tremendous development as the story continued. I also loved hearing her snarky comments along the way. Then there was Quinn. Quinn was the average described male character, except for the fact that he looked like Zac Efron **Squeals**. Throughout the book I felt as though I could've highlighted every word he said. The things Quinn said were either humorous or deep with emotion. Quinn was the most perfect love interest a book could have! The other character I felt a strong LOVE towards was Aidan. He was sweet and awesome. Aidan also had a joking type of personality that made everything he said ten times better. I also loved the way he treated Cricket. Lastly I really enjoyed the ending. The ending to this book left me feeling completed and warm inside. By the time I reached the end there had been so much development towards the characters, and also towards the story itself. Also Bethany didn't fail to include some humor to make me laugh. Even though the story ended nicely, I felt some sadness because that meant I would have to say goodbye to the characters. I guess that will be farewell till I end up re-reading this book.